Windows SharePoint Service is an add-on service of the Windows Server OS which provides collaborative development, content management, search features, etc., without any additional licensing. So how do we install this service, configure it and get started to leverage these powerful features? A shared server environment where both web-sites (Web Front Ends) and the Windows internal database (uses SQL Server technology as a relational data store to store configuration and content data) reside on the same server. This is an option when you are deploying WSS for learning purposes and want to evaluate the WSS features and capabilities or hardware procurement is a concern or user base is very minimal or want to minimize administrative overhead. A dedicated server environment where both web-sites and the Windows internal database reside on separate servers. Even the multiple web sites can be created to make a SharePoint server farm load balanced if the user base is increasing whereas database servers can be clustered to provide high availability. This is an option if you want a high performing environment and want your application to be scalable and to scale out as required. Depending on your installation this method would not be free and you might require additional licensing. Please get in touch with Microsoft to get more details on this. 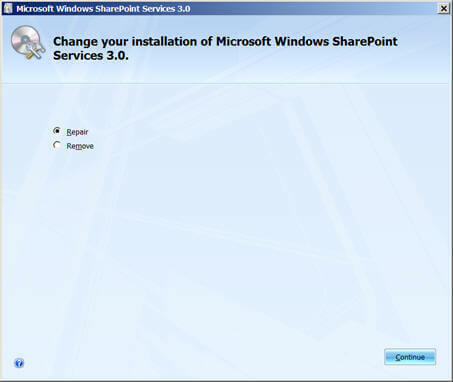 To install WSS 3.0 on Windows Server 2003 SP1, you can get the installer from here whereas to install on Windows Server 2008 you need WSS 3.0 with at least SP1 which you can get from here (though its recommended to install WSS 3.0 with SP2 which you can download from here) . Once downloaded you can extract the exe into a folder where you will find Setup.exe. But before starting the installation make sure you have any needed prerequisites available on your machine. 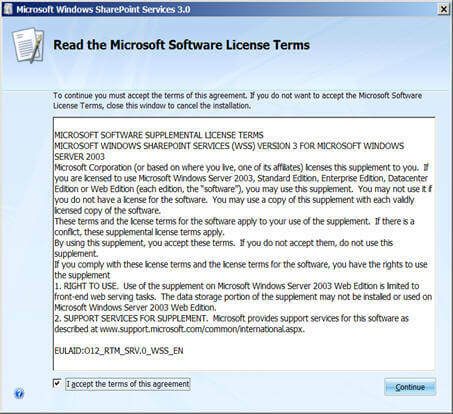 Double click on the Setup.exe to start the installation wizard, the first screen as shown below lists the licensing terms, once you are gone through it check the "I accept the terms of the agreement" checkbox and click on Continue button. Next screen, as shown below, gives different installation options. 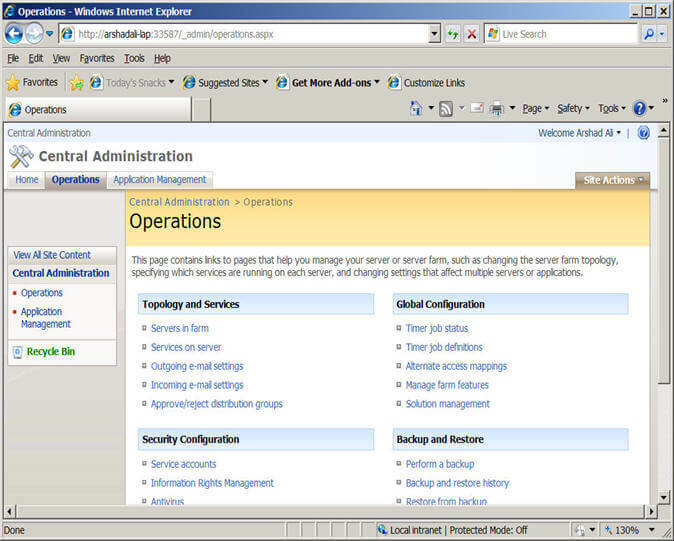 For example 'Basic' option install WSS on standalone (shared) server with default settings and would not prompt you for any other details whereas 'Advanced' option lets you decide whether you want single server deployment or create a SharePoint farm of web servers, you can even change the default data location. If you click on Advanced you will get another screen as shown below -- next where you provide other details. 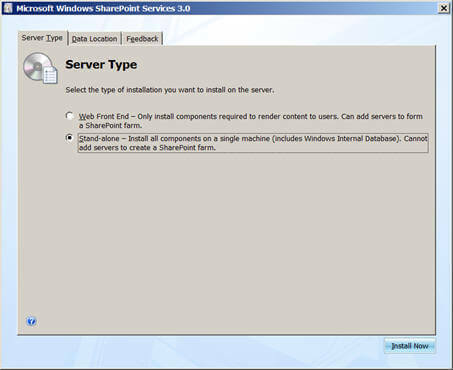 Using the Advanced option, you can install everything on a single server or you can install web front end on the server to add this machine to already created SharePoint farm. In this demonstration, I installed everything on a single shared server (stand-alone), you can refer this link if you want to deploy a server farm. Remember directly upgrading from stand alone to farm is not possible, so plan it accordingly in advance. Next screen, as shown below, will show you the installation progress and once installation is done, you will see installation complete screen. 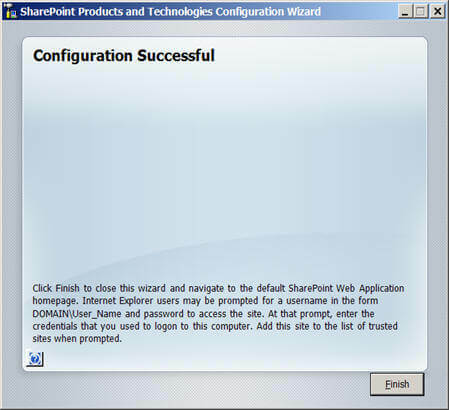 From here you can start configuring WSS on your server by launching SharePoint Products and Technologies configuration wizard. 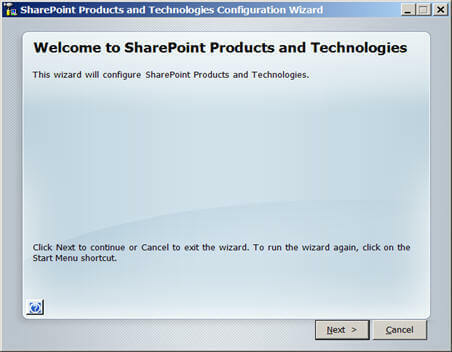 You can launch configuration just after deployment by checking "Run the SharePoint Products and Technologies Configuration Wizard Now" checkbox or later by going to START -> All Programs -> Administrative Tools and then clicking on "SharePoint Products and Technologies Configuration Wizard", the first screen for configuration is shown below. When you click on 'Next' in the above wizard screen, it will give you warning message because as part of this configuration some services are started or reset on the server. When you click on Yes, next screen will display the configuration progress as shown below. There are 10 task in this configuration once all these tasks execute successfully you will see the Configuration Successful screen as shown below. 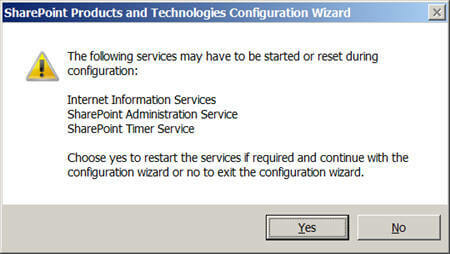 The configuration creates a default website with same name as machine as you can see below. You might need to add the created site in the trusted sites list if you are being prompted for user name and password. On the left side you can see "Quick Launch" which has several links for example "Shared Documents" you click on this link and in the right side pane you will see all the shared documents. You can also modify or upload documents if you have appropriate rights. I will be talking in details about these features in next tips. 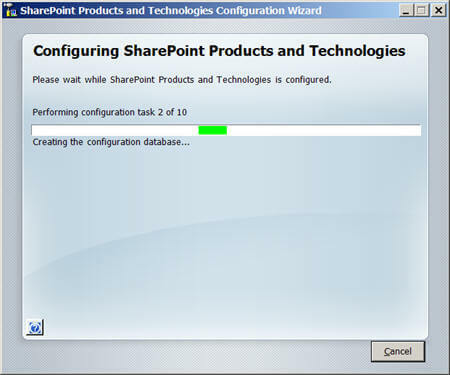 Once installed and configured you can go to SharePoint 3.0 Central Administration site (START -> All Programs -> Administrative Tasks -> SharePoint 3.0 Central Administration) for different administrative tasks. As you can see in the below image there is one Operations page which allows you to configure server wide settings; for example configuration of incoming/outgoing emails, setting of timers etc. The next "Application Management" page allows you to manage a particular application; for example you can create/delete a website, create/delete site collections, define security etc. In next couple of articles I will be talking about these different configurations in detail. Un-installation is again as simple as installation. Just double click the same Setup.exe file in the extracted folder and you will get Repair and Remove options as shown below. Just simply select the required option and click on Continue button. Next screen will display the progress and finally you will see a confirmation screen once it is done. Please note, un-installation does not remove the content databases of the sites which you have already created. As per your environment and need, download WSS from Microsoft Download Center, install and configure it as demonstrated above. 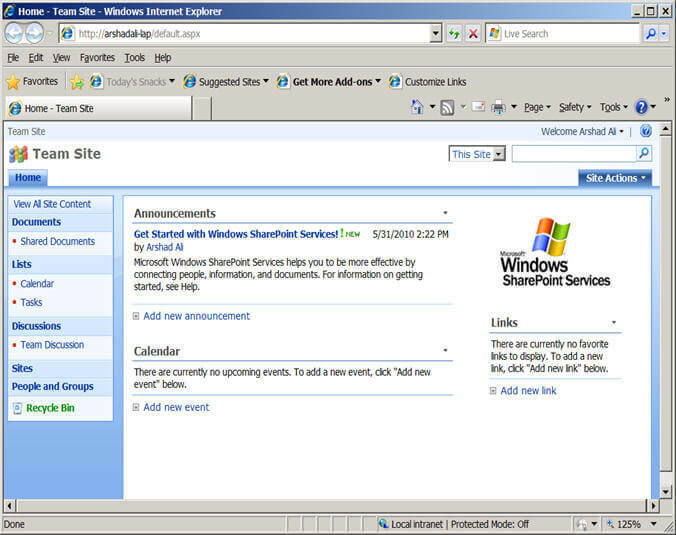 Windows SharePoint Service is available here. 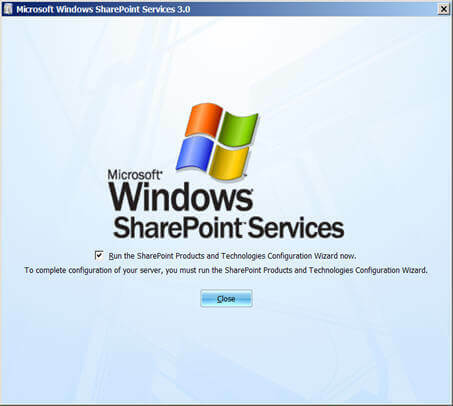 Windows SharePoint Service SP1 is available here. 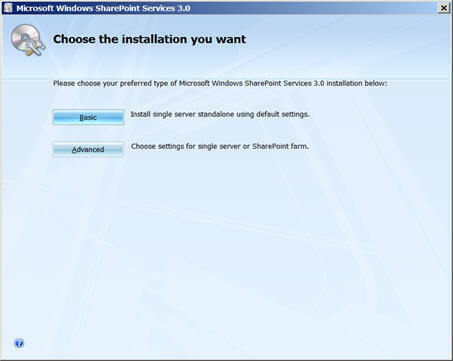 Windows SharePoint Service SP2 is available here. 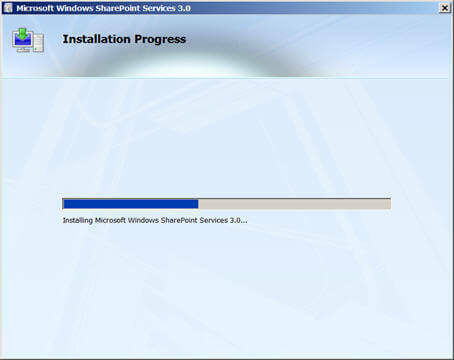 Review Installing SharePoint Foundation 2010 on a Single Server - Part 1 tip. Review "Understanding Window SharePoint Service (WSS) 3.0 and Microsoft Office SharePoint Server (MOSS) 2007".